My mother and I have an arrangement. She gives me jam and pickled beets and the like, and I return the empty jars to her for the next go round. Except when I don’t return the jars and begin to use them as my new Tupperware for traveling. Usually it’s trail mix, granola or this time around, To-Go Oats. She always eventually gets the jars back, as I start collecting too many. In the meantime I have an excellent collection of portable containers. The last several years have seen me as an on again/off again weekend traveler. These next few weeks are no exception, as I will be on the road again and again until mid-September. I am definitely counting down the days (less than 30, I hope!) until W moves back for good. I’m squirming in my seat and imagining all the activities we can enjoy together that have been missed this last year. I just can’t wait. Though I’ve always been big on traveling with food and eating a consistent diet no matter the circumstances, after discovering all of those pesky dietary restrictions in the last couple years, it has become mandatory to travel with a bit of food insurance. Throwing a batch of oats with all the fixings into a pan is my thing. I can leave the cooler with every random pantry item that I mightneed at home. 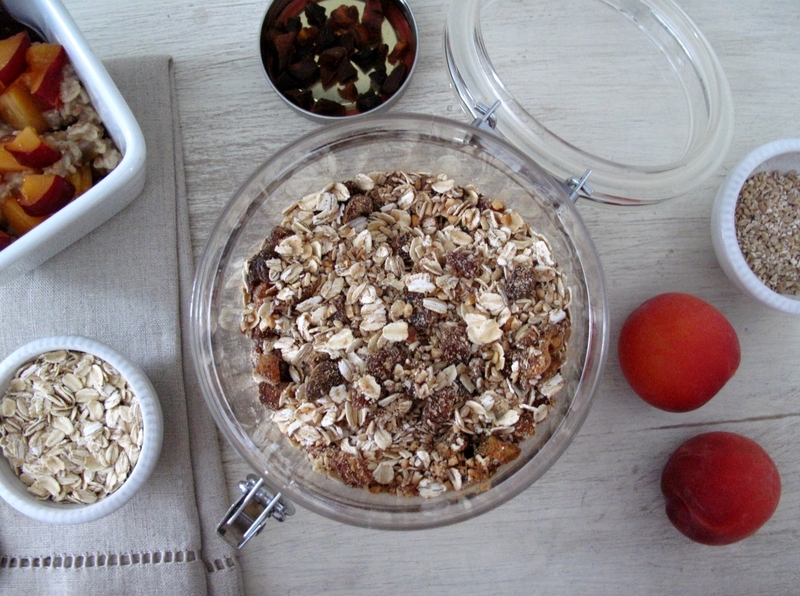 Instead, breakfast is all there in a convenient jar to be poured into a pan and made into a bowl of goodness. 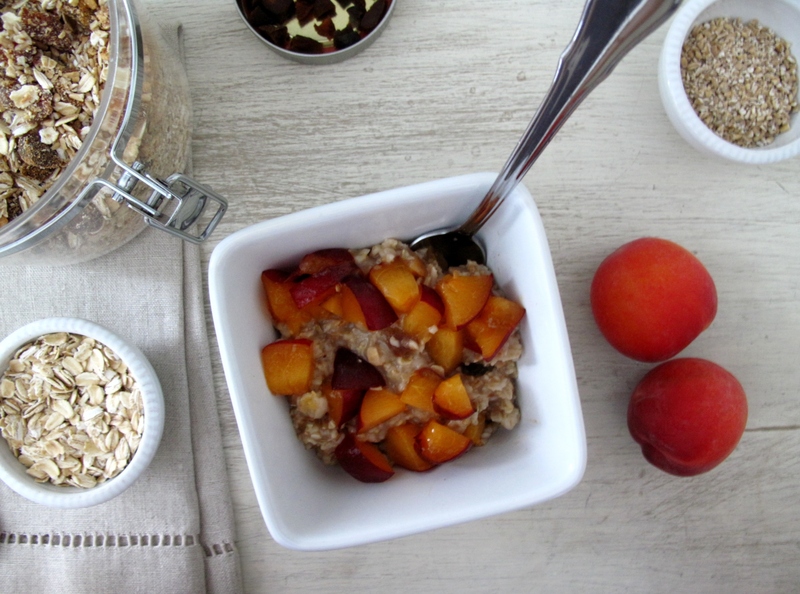 I like to add both old-fashioned thick oats and steel cut oats because I like lotsof texture. This batch includes a strangely addicting mix of fennel seeds, dried apricots, cinnamon and roasted hazelnuts. It is happiness in a jar. I always add fresh fruit, and this time around decided to double up on apricots, adding fresh red apricots to the top once cooked. The beauty of this mixture is if you’re an oat and yogurt kinda person, this is practically muesli-esque and can be used both ways. Did I mention I am excited to now be participating in Recipe Redux? This month’s theme is Raising the Bar on Food in a Jar. Measure into a clean jar, spin the lid, and shake. You’re ready to go! To cook, boil 1 cup water in a small saucepan. Add entire contents of jar, turn heat to medium and cook about five to 10 minutes, depending on desired consistency. * I use Bob’s Red Mill gluten-free oats, but any brand will work, if you’ve no gluten problems. Wow! You were QUICK getting this beautiful post ready in just a few days! Welcome to Recipe ReDux! I love the idea of adding fennel seeds to breakfast! Yum! Thanks Serena! It just so happened I was planning to make up a batch anyway so the stars aligned! 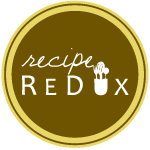 Welcome to Recipe ReDux! This looks absolutely delicious! 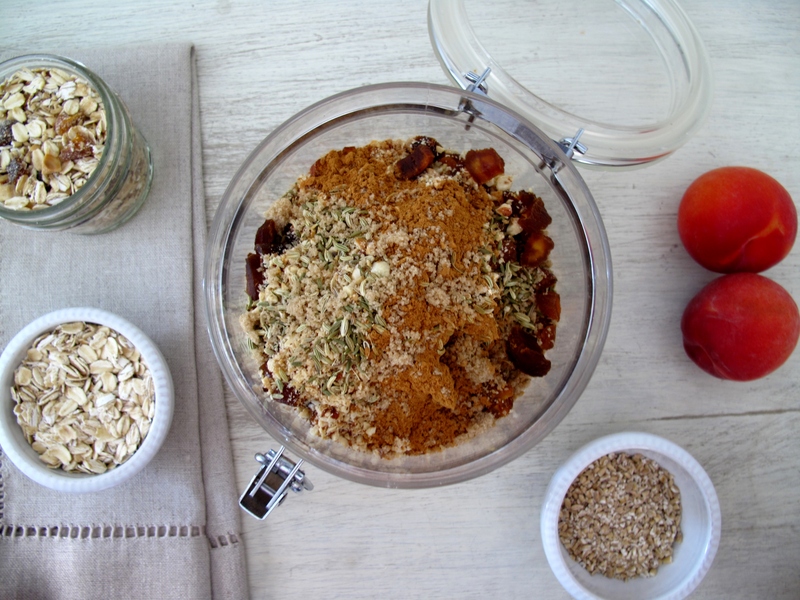 I love the mix of fruit and spices in these oats. I’ll definitely be trying this out soon. Thanks for sharing! Huge fan of texture too! Will definitely be combining old fashioned and steel cut oats in my next breakfast jar. Welcome aboard to ReDux and kudos for putting a post together so quick – a terrific, interesting post to boot! Would love to wake up to these oats in the morning. Thanks Deanna! I’m excited to join! Welcome! This looks fabulous, I love a hearty bowl of oatmeal. Great post! It sounds so simple, and looks amazing!